This is kind of following on the heels of why we don't Montessori anymore, but I've recently become more open to the benefits of plastic toys. In fact, I think plastic toys are helping me get to heaven. What? What? Well, I used to be anti-plastic toys. 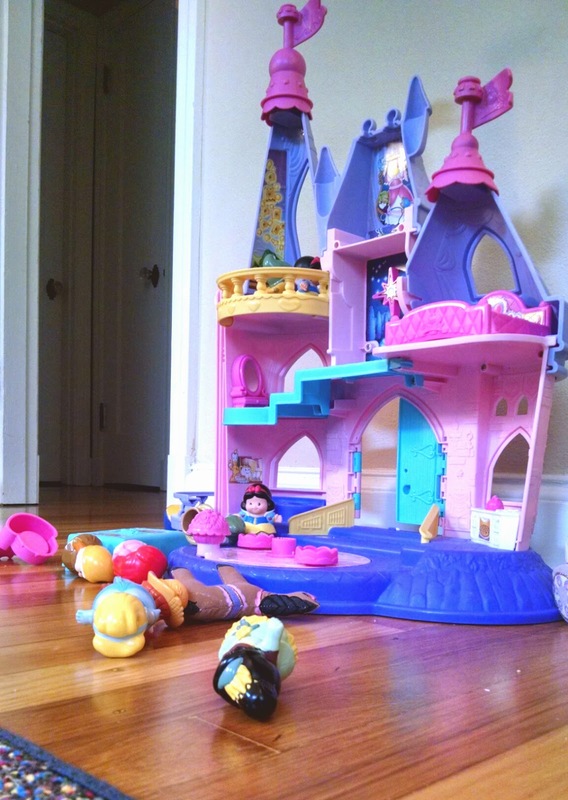 I mean, not totally anti-plastic toys, but I was quite determined to keep plastic toys in our home to a minimal. (Honestly, I still am a little bit, because I still think that wooden and cloth toys are more beautiful.) But, lately, I've noticed something. 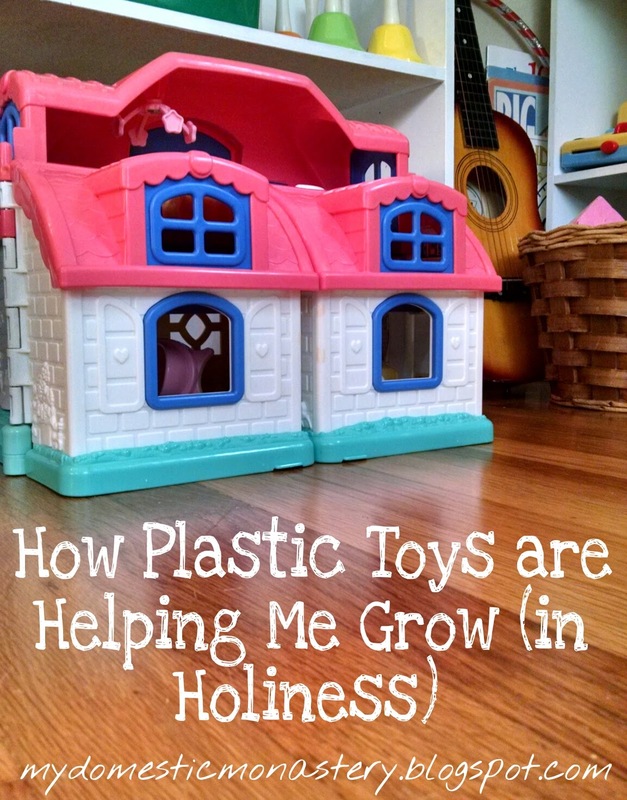 Therese is drawn to certain plastic toys of ours in a way that she isn't to some of our wooden toys. I know, I know, the fact that they are bright and gaudy has something to do with it, but regardless, I can't ignore the fact that they serve a definitely purpose for her. Take the dollhouse pictured above, for example. We found that and a whole box full of accessories for $1. Yes, we have a beautiful, large wooden dollhouse, but I haven't been able to afford furniture for it yet (soon!). She plays with it, but without the accessories, it just isn't as fun. But this little dollhouse (complete with furniture, people, and cars0 we found for a buck? Hours of fun. So, how does this relate to my holiness as a mom? It is so easy to approach motherhood the way you do everything else - research thoroughly, and apply your research, making decisions based on the data. It works for so many other big and small choices, right? But it doesn't always work with kids. I can have a definite idea in my head of what I do and don't want for my children, but if it doesn't fit their actual needs...well, then I just find myself stubbornly enforcing a system that doesn't actually work. So, as much as I see Therese and Maria drawn to some of the toys that I think are beautiful - some of them are just ones they'll have to grow in to. And in the meantime, those plastic toys - in all their gaudy glory - serve a need for them. The thing is, this lesson doesn't stop with plastic vs. wooden toys. It extends to more serious areas of life. As their mother, I definitely have hopes and dreams for their future. But, ultimately, their future isn't just about what I want for them. It's about what God wants for them. And let's face it - I might not be thrilled with God's plans for them. God may be calling them to live and work far from me, to join a super cloistered religious order where I never get to hug them again - I just don't know what God has in store for them. In the more immediate future, I may have to relinquish how I teach them, or even where I teach them (we continue to prayerfully discern how homeschooling may or may not play a role in our family each year). And darn it...I may need to let them play with those plastic toys. Ultimately, these precious little girls aren't mine. They aren't Andrew's. They are God's. Yes, He has entrusted their precious little selves to us for a time. But it isn't up to us what direction their lives take. We can guide them. We can nurture them. But we can't dictate or control what they will become. And don't forget! The Giveaway is still running for the rest of the week! Enter to win a copy of Faith Beginnings - Family Nurturing from Birth to Preschool.